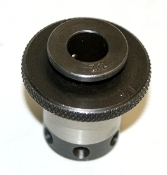 Part: 51-008, Size #1 Adapter, 3/4" Quick-Change End, Tap Size: 1/2, Accepts Shank Dia. : .367", Square: .28". Compatible with Smith Ball-drive and Bilz-type Tang drive tap chucks, Lyndex, Collis, Universal and others.